Television industry leaders Joerg Heise and Gary Burns, keynote speakers at today’s ‘Cutting Edge Technology in Sports TV’ session at the Asian Racing Conference, entertained and informed a large audience with the latest innovations in sports broadcasting – some of which may potentially be applied to horse racing. James L. Gagliano, President and Chief Operating Officer of The Jockey Club, shares his views and opinion to all attending delegates. That was a significant focus of the session, along with the conviction that innovation not only lifts the viewer experience to a higher level but is also likely to extend attention span, and increase audience retention and participation. This view was endorsed by Oonagh Chan, the Hong Kong Jockey Club’s Head of Broadcasting Services. “We strive to provide a memorable visual and auditory experience to local and overseas customers, to stimulate customer participation,” Chan said. Chan also emphasised the need to liberate viewers with the power of choice embracing 'second screen' interaction. “We must unleash the power of choice by developing and designing content across multiple media platforms to enhance the customer's experience," Chan said. Burns, Head of Programmes and Production at Fox Sports in Australia, said that broadcast innovation was the key to delivering an entertaining experience. He pointed to Fox Sports’ innovations in other sports, including cricketer Shane Warne being ‘mic’d up’ and predicting the dismissal of a batsman as he prepared to bowl, and suggested that a ‘live wire’ to a jockey or trainer could enhance the racing TV experience. Burns also suggested that the broad 360 degree camera shot, popular in football and rugby coverage, could be well applied to paddock coverage at the races. “In play innovations are an important part of improving coverage, but are not possible without the support and co-operation of the clubs and governing bodies,” Burns said. Hiese emphasised the need to innovate in all sports coverage, including horse racing, and pointed to potential economic benefits. “Advances in television technology can create brand new perspectives and the commercial logic of live coverage is that attraction and emotion can generate transaction,” he said. Innovations, including cameras attached to the helmets of jockeys, will continue to be developed further, including a Riedel HD helmet-cam project in conjunction with the Hong Kong Jockey Club. 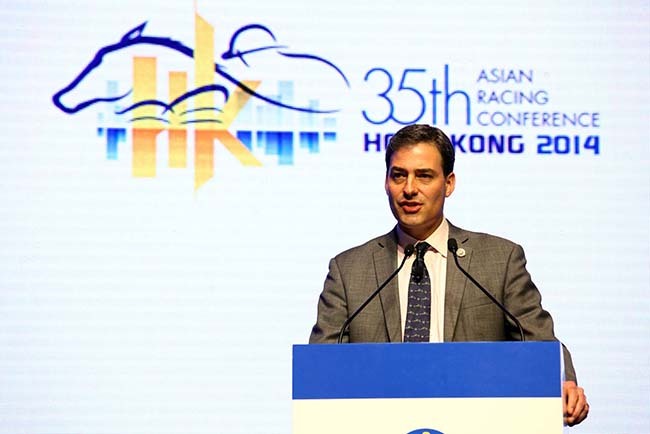 Today’s session also heard from James Gagliano, President and Chief Operating Officer of The Jockey Club in North America, who spoke of the importance of promoting racing to a new audience via television, and backing that up with imaginative multi-channel marketing. The final presenter was Burak Konak from the Jockey Club of Turkey, who charted the development of television coverage of horseracing in his country. Mr Konak explained the huge impact that television coverage had on the level of wagering turnover in Turkey, but also highlighted the opportunities that had been gained to transmit the beauty and excitement of horseracing to a much wider audience.